I remember growing up in New York and feeling gipped when Spring rolled around. Why? Because 90% of the time it was still cold! My parents told me that last Saturday it was snowing. Brrrrrr! Sort of doesn’t really match the image I used to have of spring — lying under a flowering tree, daffodils and tulips under a sunny sky. I’d rather hunker down with a bowl of hot soup wearing a beanie and not a bonnet. But nature is giving us some new foods to enjoy, to help us detoxify all the stuff weighing us down from winter. I’ve been making mostly thick and hearty meal-in-a-bowl soups like lentil or mushroom-barley. But I saw gorgeous green local asparagus at the farmer’s market the other day and jumped for joy. 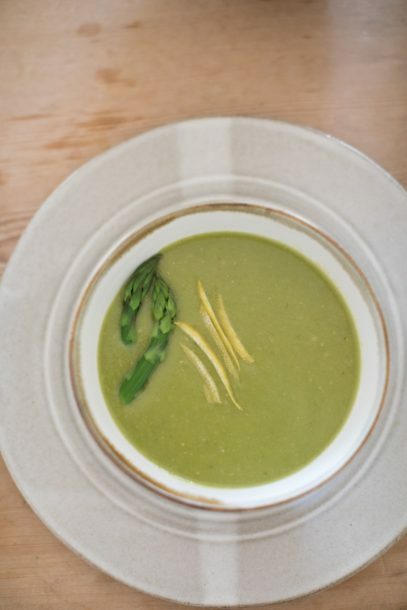 And then I made asparagus soup! Since the season is so short, I will prepare it at least once a week until I see the words “from Mexico” and then it’s adios asparagus! Believe it or not, asparagus is a total powerhouse vegetable. It is rich in antioxidants which protect against free radical damage. Asparagus also contains high amounts of histones, folic acid, and nucleic acid, which boost the immune system. It contains high levels of the amino acid asparagine, which serves as a natural diuretic, and increased urination not only releases fluid but helps rid the body of excess salts. This is especially beneficial for people who suffer from edema (an accumulation of fluids in the body’s tissues) and those who have high blood pressure or other heart-related diseases. And it is a particularly rich source of glutathione, a detoxifying compound that helps break down carcinogens and other harmful compounds. This is why eating asparagus may help protect against and fight certain forms of cancer, such as bone, breast, colon, larynx and lung cancers. This creamy soup is so lovely and EASY. Easy enough to make tonight on a moment’s notice and special enough to serve for your holiday luncheon or dinner. Guess what? Passover is next Monday night and Easter is in less than two weeks. Time to get those menus in order! This soup is perfect and of course, it gets its creaminess not from dairy, but from one of my favorite non-dairy tricks, oats! Crazy, right? 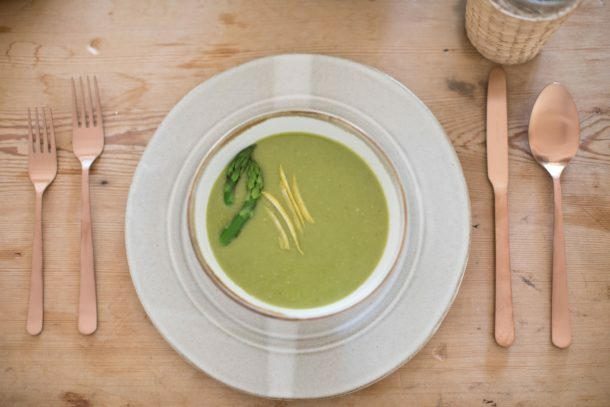 You cook rolled oats with the asparagus and puree everything to a thick and silky creaminess which tastes nothing of oats and only fresh asparagus! If you need this soup to be Passover-friendly, you can substitute 1 pound of Yukon Gold potatoes for the oats. I have made this soup with all vegetable broth and it was terrific. I tried it will all chicken stock and I thought it was a little too chicken-y. 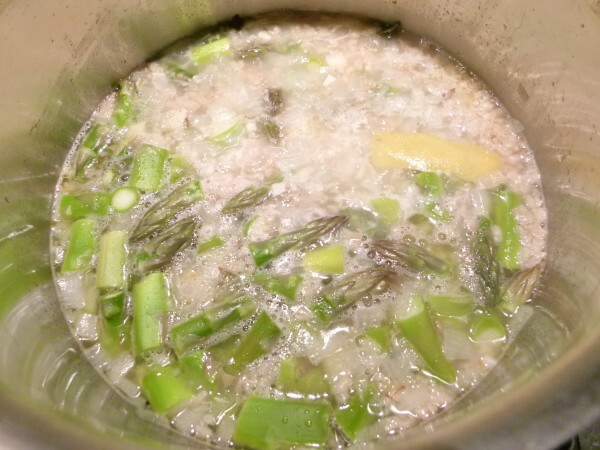 My favorite way is with half chicken stock and half asparagus stock — amazing! What’s asparagus stock? You take the woody ends from the bottom of the asparagus spears and simmer them in water until you have a lovely, delicately-flavored asparagus broth. 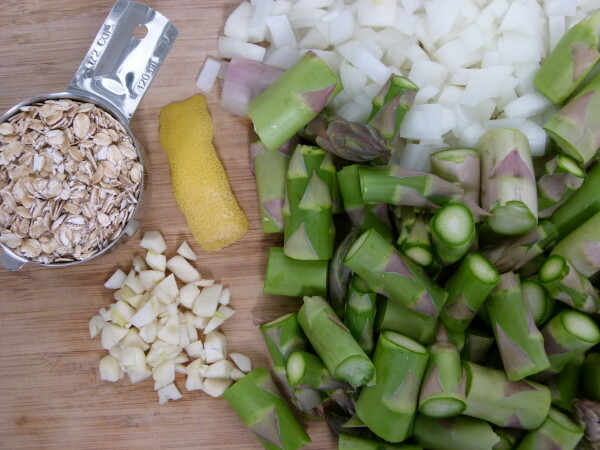 This would also be awesome for a vegetarian asparagus risotto! (Easy-to-follow instructions are at the bottom of the recipe.) Happy Spring! In a medium saucepan, heat the olive oil. Add the onion and sauté over medium heat until tender and translucent, about 8 minutes. Add the garlic and cook for 2 more minutes, stirring frequently. Add the remaining ingredients to the pot. 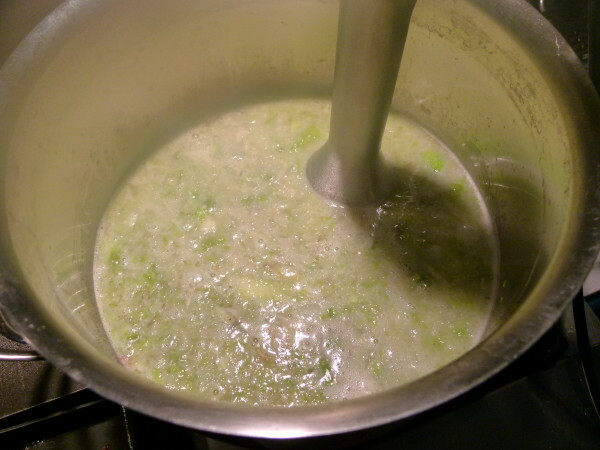 Bring soup to a boil and lower to a simmer. 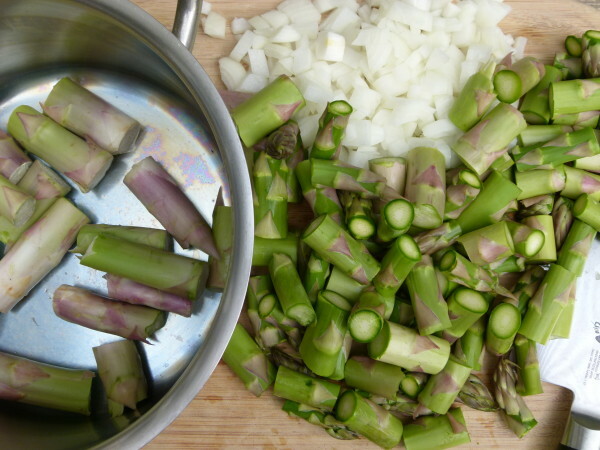 Cover pot and cook for 10 -15 minutes until asparagus is very tender. Turn off heat and remove the lemon peel. Or for a more assertive lemon flavor, blend the peel or half the peel with the soup. Puree the soup until smooth, either directly in the pot with an immersion blender or in batches in a blender (keep the lid open a crack. 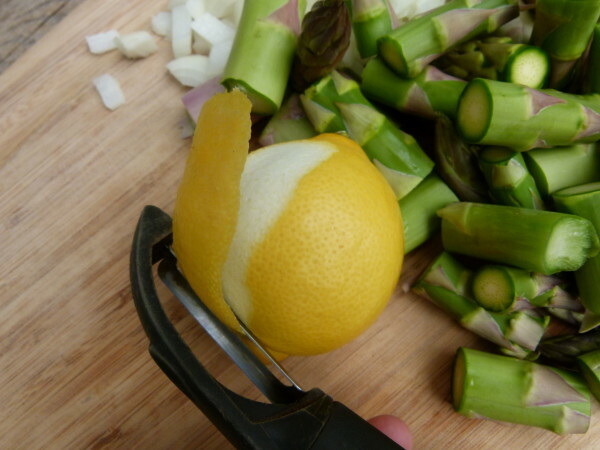 )Ideas for garnishes: steamed asparagus tips, garlic croutons, shaved Pecorino-Romano cheese or chopped chives. 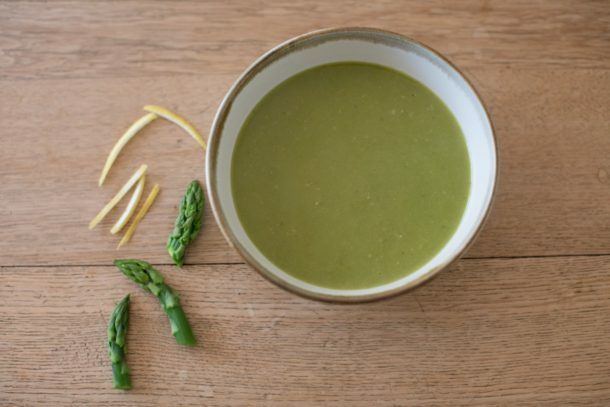 *Save the ends for vegetable stock (recipe here) or boil the ends in 3 cups of water for 20-30 minutes for an asparagus stock. This should yield approximately 2 cups of asparagus stock, but measure anyway. Do you have the nutrition information for this recipe posted anywhere Pamela? I have been making this recipe for the last 2 years and it is a favorite of mine. I recently got an Instant Pot and am wondering how to adapt this to cook in a pressure cooker. Can you advise?? I love this recipe too, but honestly it will take just as long in the Instant Pot as it will on the stove. Don’t forget that the Instant Pot when using the pressure cooker setting takes 8-15 minutes just to achieve pressure and then it cooks for the time you set it for. And then you have to release the pressure. So for a quick soup like this, I wouldn’t advise using the Instant Pot. Absolutely delicious and so easy to make. So happy with a good dairy free soup that everyone can enjoy! If you feel comfortable, try subbing a different vegetable (carrot or cauliflower) and coming up with another pureed soup! Thank you very much for sharing this recipe! I’ve been looking for a gluten/dairy free cream of asparagus that is delicious and minics the natural rich creaminess of the real thing. I added a pinch of italian seasoning to the aspargus tips and some grated guda (for those who aren’t lactose intolerant) and it was a big hit! Definitely going to make this as often as possible!! OUTSTANDING!!! Really tasty and a great texture to one’s palate. Very rich, very smooth, had it for Thanksgiving and made it again for a dinner date tomorrow evening. Easy to garnish also a few croutons and a couple of asparagus spears. Quite a phenomenal dish! Nice! Thanks for the feedback! Can you make this recipe ahead of time? If so how many days and can you freeze it? Sure! It lasts a couple days in the fridge. I imagine it freezes fine, but I haven’t tried to. I had some asparagus in the fridge that had been there a little too long, and this was a great way to use it up. Love the oatmeal idea — will use it for other “cream” soups. Why gluten-free rolled oats? I don’t see that written on container. Thanks! You don’t have to use gluten-free rolled oats if you’re not gluten-intolerant. If the package doesn’t say gluten-free, they’re not. It’s a great soup no matter which oats you use! I made the soup and it’s fantastic! I just found your site a few days ago & look forward to trying more of your healthful recipes. Thanks for the recipe. Very tasty. The only thing I added was a tsp of turmeric powder. Good call on the turmeric! Coupled this soup with Baked ham panini (for the members of our family who eat meat), made a shredded salad and it was the perfect Easter dinner. We eat a huge brunch but get hungry again by evening. Mid west weather the soup was perfect and cozy! Plus the color was so beautiful. Thank you for taking the time to share, Cheryl. That sounds so nice! I can’t have dairy so I avoid any creamy soup (and miss it) This soup however is wonderfully “creamy” and just simply good. Thank you. Can you substitute anything for the oatmeal to give the soup body? Almond flour maybe? Any ideas? I also mentioned in the post that you can substitute 1 pound of Yukon Gold potatoes for the oats, just make sure you cook them in the soup until they are very tender. Enjoy! Thank you for this beauty! I can’t wait to try it!